Another week comes to an end. Time for another seven quick takes. “There’s no place like home.” I know I used another SQT to lament about long car rides with children before, but Dorothy’s ruby slippers sure would come in handy driving through west Texas. Aside from the long car ride, we enjoyed the visit with my parents and grandparents, my sister, an aunt and a couple of uncles and second cousins. We also enjoyed much more eating out, especially of the Mexican food variety than usual. It is back to the eating almost every meal at home routine – which means I have to make a menu and grocery shop. In addition to visiting with family, we enjoy meeting up with friends in person when possible. Dietrich welcomed the opportunity to stay up late and visit even though he struggled some the next morning. He believes his bedtime should always be 10:00 and that he is never tired. “I go to sleep when I go to sleep,” he says, matter-of-factly. Well, yes, but you go to bed when I say at least for now. 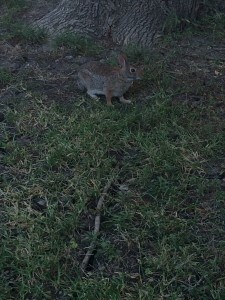 My parents have a bunny that lives somewhere in their yard… maybe under the shed. 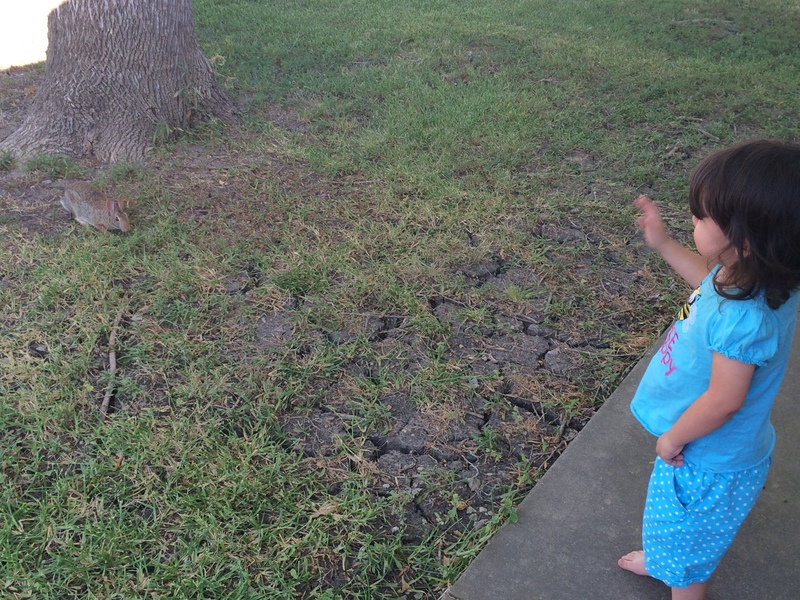 Madilynn really thought this bunny needed to come play with her. While I am glad the bunny let us get as close as we did, I am even more glad it did not allow us to get closer. About a day after arriving at my parents’ house, I received word that the kids’ allergist appointments were scheduled. Maybe if testing doesn’t reveal rabbit or livestock allergies, I can find a petting zoo for Madilynn. I used the time… hours… in the car to catch up on my Bible Reading. Though I’m still not halfway through July on the calendar, I made through the book of Job! Since we start by reading a Psalm a day, that means I’m halfway through the Bible, approximately. Hey! you figured out how to comment! Riff raff indeed!